Welcome back to The Cookie Elf File! During December, look for 12 easy Christmas cookies from The Elf – recipes and simple baking tips for baking them. 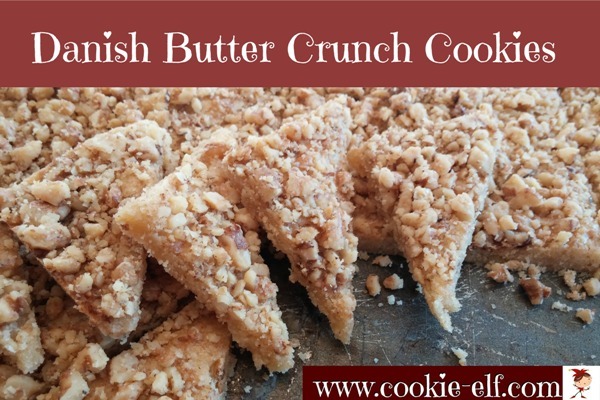 Danish Butter Crunch Cookies are a cross between bar cookies and shortbread with nuts layered on top. The cookies don’t exactly follow the time-honored ratio in shortbread’s traditional three key ingredients: one part sugar, two parts butter, and three parts flour. The additional butter (or margarine) makes a richer cookie. And with just 6 ingredients, it’s easy to see why this can become one of your favorite easy Christmas cookie recipes. When using nuts in shortbread cookie dough or on the surface of the shortbread, chop them as finely as possible. In the case of Danish Butter Crunch Cookies, finely-chopped nuts will adhere easily to the egg white coating on the surface of the bars … while coarsely chopped nuts will make the cookie surface rough and difficult to cut into bars. 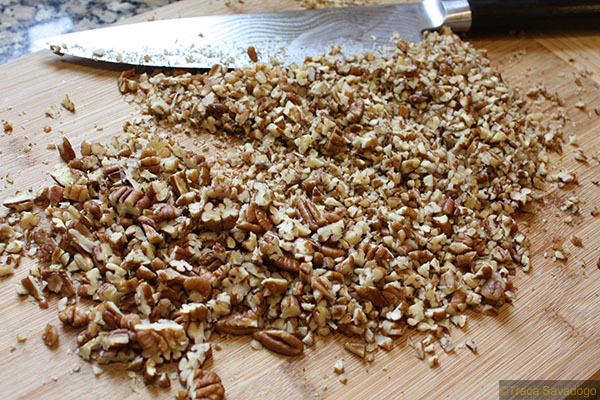 Try using a steel blade in your food processor to pulverize nuts.